The Elite Guardian Mouse is a breed of mouse found in the Sunken City. It is known to drop Oxygen Canisters as loot. Highly-trained guard that is sworn to protect the citizens of the once lost Sunken City. More importantly, to protect their most precious commodity: Oxygen! These guards keep a wary eye about for those looking to grab a little more than their allocated stipend. The Elite Guardian Mouse has been found to be especially attracted to Fishy Fromage, to the point that any other kind of cheese will simply not suffice. The Elite Guardian Mouse is susceptible only to Hydro weapons. The Elite Guardian Mouse drops the Salty Sea Egg during the annual Spring Egg Hunt. 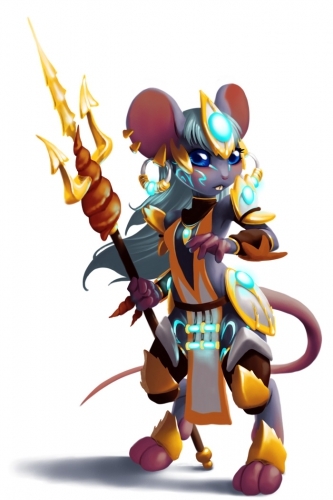 The Elite Guardian Mouse was released 2 July 2014 as part of the Sunken City content. This page was last edited on 18 January 2016, at 02:54.